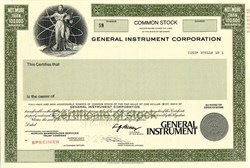 Beautiful engraved specimen certificate from the General Instrument Corporation dated in 1989. 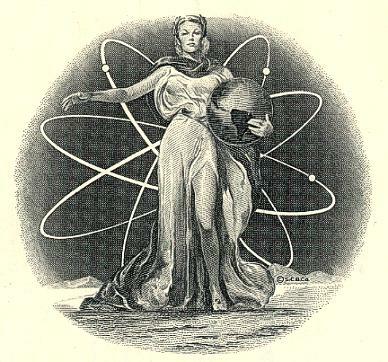 This historic document was printed by United States Banknote Company and has an ornate border around it with a vignette of an an allegorical woman with electrons in the background. This item has the printed signatures of the Company's President and Secretary and is over 18 years old. General Instrument (GI) was a diversified electronics manufacturer which specialised in semiconductors and cable television equipment. The company was active until 1997, when it split into General Semiconductor (power semiconductors), CommScope and NextLevel Systems (the cable and satellite TV division, which later reverted to GI name). The new (post-split) General Instrument Corporation was later acquired by Motorola and became the Motorola Connected Home Solutions division. Donald Rumsfeld served as CEO of General Instrument from 1990 to 1993.